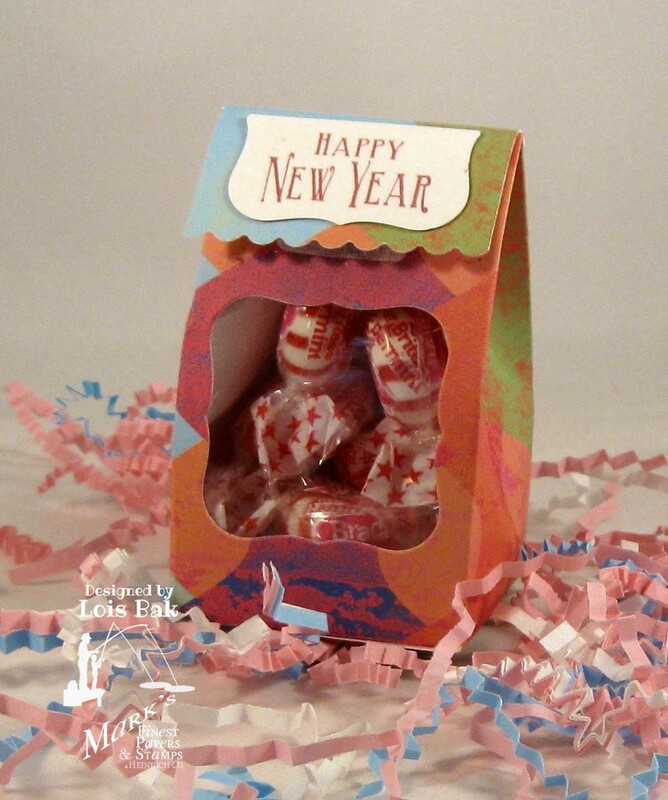 You could easily make many of these as favors for a New Year's Eve party. I altered Jane's tutorial just a little bit by adding the flap at the top, which I closed using a little bit of velcro. If you'd like to see what the members of the Tutorial Team made using Jane's tutorial, check out this week's column on Speedy TV. Please hop along with us! You have a chance to win one of the above stamp sets! Just comment on the following blogs (don't forget this one) each day for more chances to win! (You do NOT have to comment on all the blogs each day! The names are drawn randomly!) 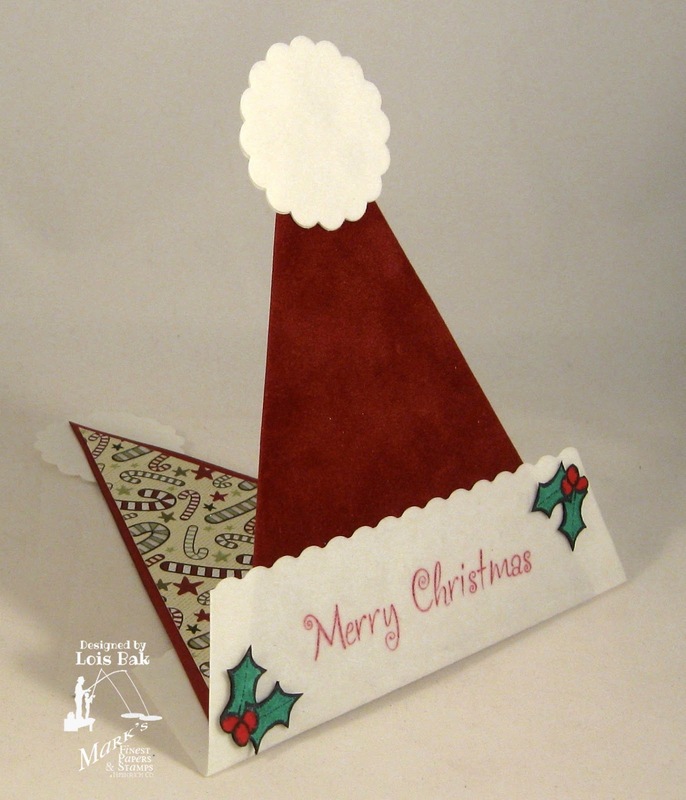 All four winners will be announced on December 22, 2012, on the Mark's Finest Papers blog. You can go back and comment if you missed a day. 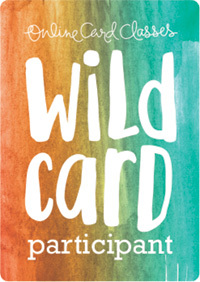 (HINT: The more you comment, the more chances you have to win; and comments on the MFP blog count twice!) The deadline for commenting is 11 PM EST on Friday, December 21, 2012. 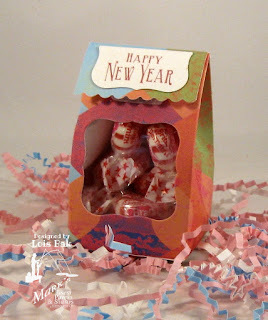 Here it is -- the last day of the Blog Hop. And Christmas is right around the corner. Again, all of us at Mark's Finest Papers, a Heinrich Company, want to wish you a very Merry Christmas and a Happy New Year! Today's cards were the most fun for me to make this week. And I think that little Scottie dog is my favorite image this month! 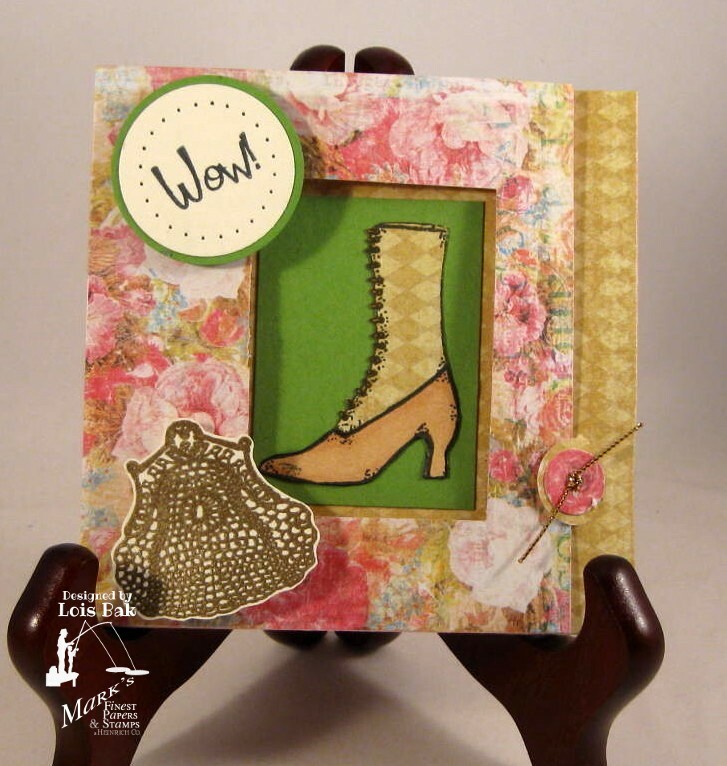 My first card was made using Scor-Pal's tutorial called Double Fold Card. Here's the tutorial. I was a bit timid getting started with this one, so I used a piece of copy paper first until I was sure I knew how to fold and cut it. After a couple of stutter starts, I figured out what to do. 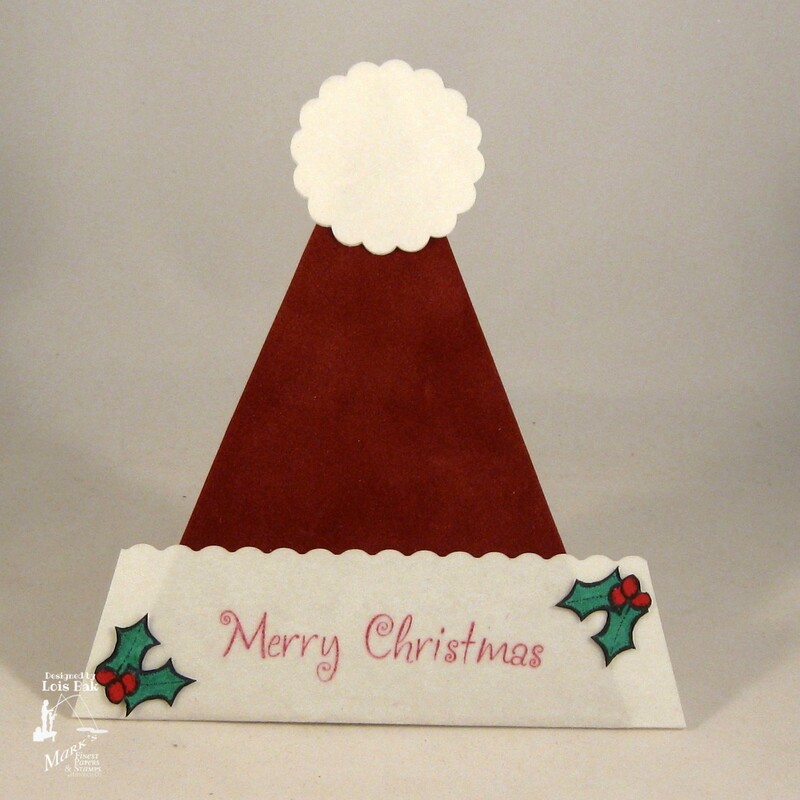 The base of the card is MFP Snow Storm Heavy; the mat is Masonry Red; and the DP is Basic Grey Oxford. I love that plaid! 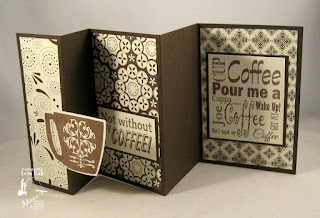 I decorated the middle panel with a Spellbinders Lattice border diecut. I wanted to use the plaid background stamp, and I also wanted more than just two colors. So my second card was actually the most fun of the week. 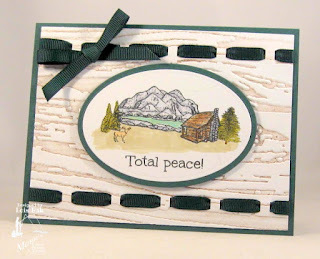 It was made using the tutorial which appears on Splitcoaststampers. 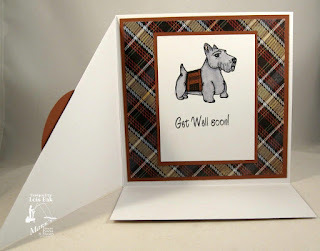 To make the plaid, I first stamped the image with Versafine Crimson Red onto a piece of yellow DP. I confess it was in with my scraps, so I don't really know whose it is -- other than it's probably from a Basic Grey pad. Then I clear embossed it. To get the third color into the plaid, I stamped the image again onto a scrap of MFP Special Mint, embossing with clear embossing powder. Then I carefully cut the green strips and glued them onto the original piece. In order for it to fill up the space on the bottom of my easel card, I had to mat it with several layers of coordinating cardstock. I paper-pieced the blanket on the Scottie dog in the same manner -- with the strip of green. I finished it off with a few little buttons and some paper piercing. As a bonus today, I made a card using the extra set for this month, You've Got Style. 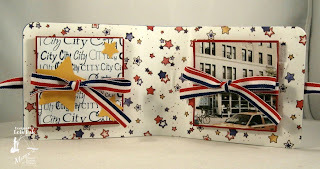 The card was made with another Scor-Pal tutorial, Cami Tri-Fold. I followed Cambria's directions, except that I had to make the opening on the front wider to accommodate the size of the shoe. The purse was stamped with Versamark and embossed with Detail Gold embossing powder. The papers were from Prima's Annalee patterned paper. This is what the card looks like opened all the way. You can see how the fold allows the shoe to peek out of the opening in the center panel. I hope you have enjoyed all the tutorials I included in my posts this week, and I hope you try one or two of them. 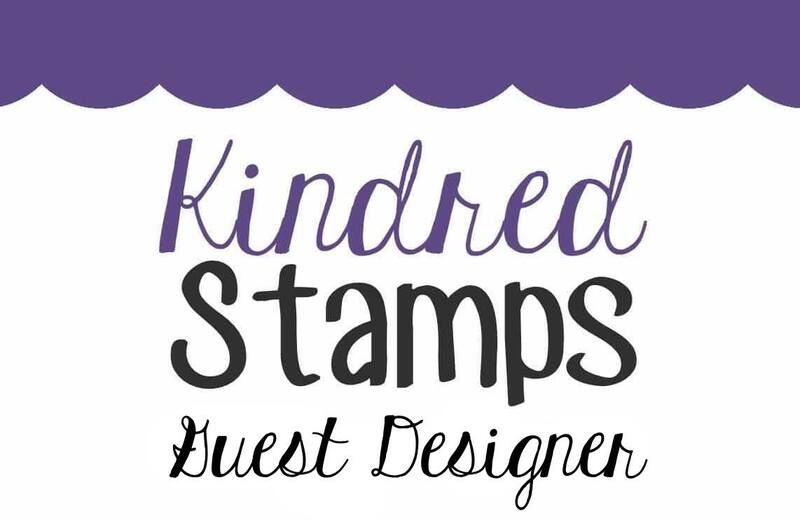 Make sure you visit everyone else's blogs today and comment often for a chance to win a free stamp set. 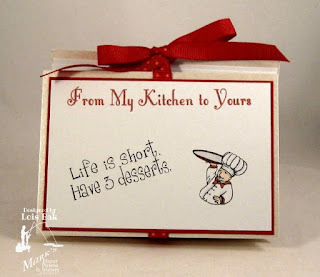 My first project using today's set, Recipe Card Starters, actually has no Scor-Pal tutorial. I made it up as I went along. I'll try to explain exactly what I did. It's a little wallet with several of our favorite family recipes in it. I actually used images from both today's set and the mini-set, called Recipe Completer. The cover is a piece of cardstock cut 12" x 5". I scored it at 3 1/2" from each end. 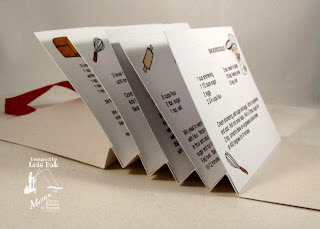 Then I scored it again every 1/2" between my first scored lines, folding both mountain and valley folds to make an accordian, After printing out the recipes and cutting them to 3 1/2" x 4 7/8", I glued one recipe to the front of each fold, as seen on the side view below. As you can see, I added small images from both sets to each of the recipe cards. Before I put the cover on the front, I cut a piece of ribbon long enough to be able to tie it closed. Applying some Scor-tape to the back of the ribbon allowed me to glue it in the folds also. After the ribbon was secured, I attached the cover to the front. One of the recipes in this little wallet is Pumpkin Bread, a recipe my aunt shared with us many years ago. I have often given loaves of this scrumptious dessert as Christmas gifts. 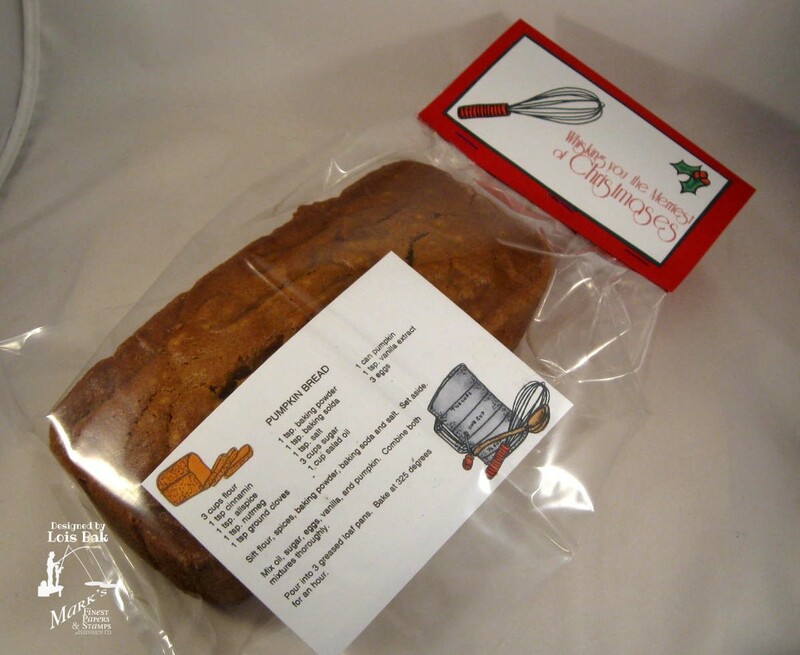 I put a loaf of pumpkin bread in a clear bag along with a recipe card and closed the bag with a tag I made using several of the images from today's set as well as a holly sprig from MFP Holly Jolly Greetings. 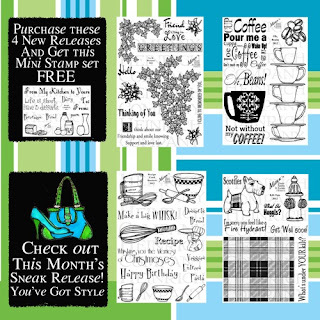 Check out the great deals and stamp sets for you this month. Continuing with my Scor-Pal tutorials, I have two more cards for you today. The first one is a small card, measuring 3" x 4 1/4" (closed). 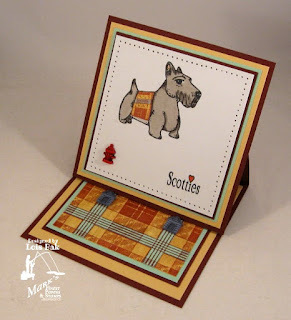 Scor-Pal calls it an Accordian Fold Card. Here is the tutorial. I think it's big enough to enclose a gift card to Starbucks maybe! The closed card has a small belly band around it to keep it closed. I added some gold cord and a charm. 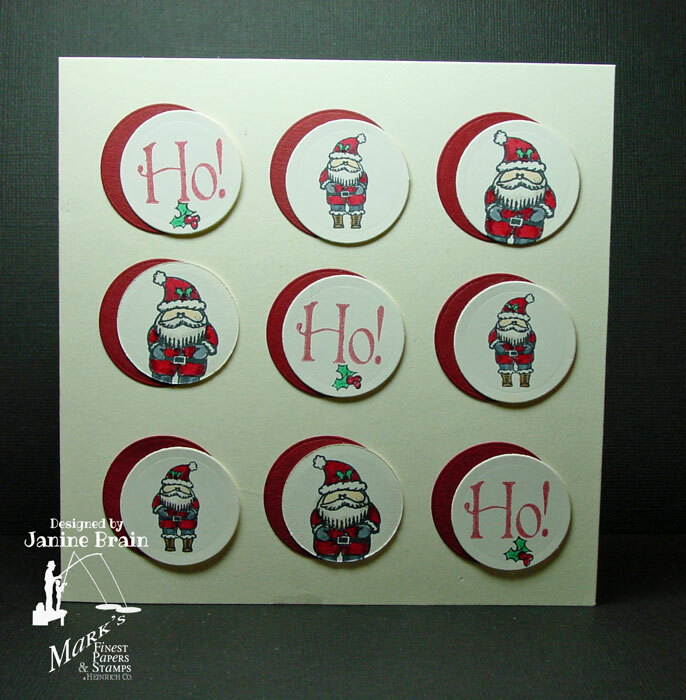 My second card using today's set is a rather untraditional Christmas card. The stacked coffee cups are plain -- no pattern. I just took several images from the MFP Christmas Selections set and, voila, we have instant Christmas cups. 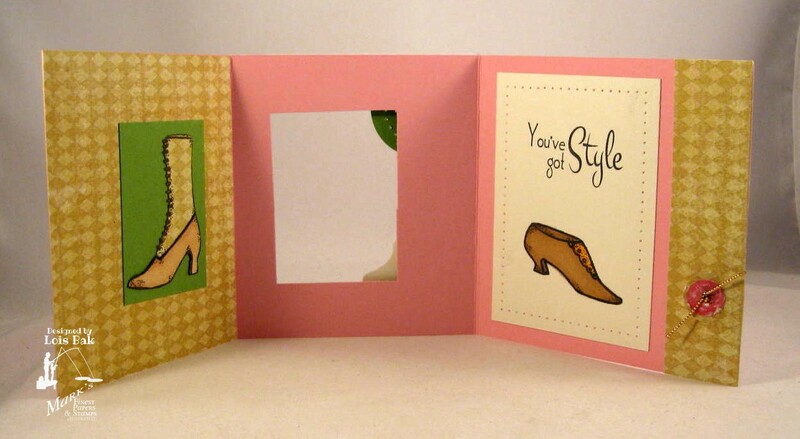 This is a free-standing Pop-Up card. Here is the tutorial. I think my daughter would enjoy this card. She says you can't talk to her until she's had two cups of coffee in the morning! The "Merry Christmas" is from MFP Winter Scenes. I hope you've been enjoying the blog hop so far this week. I'm sure the rest of the team has had fun with this month's sets. I know I have! Vicky Gould is next on the list. Please hop along with us! 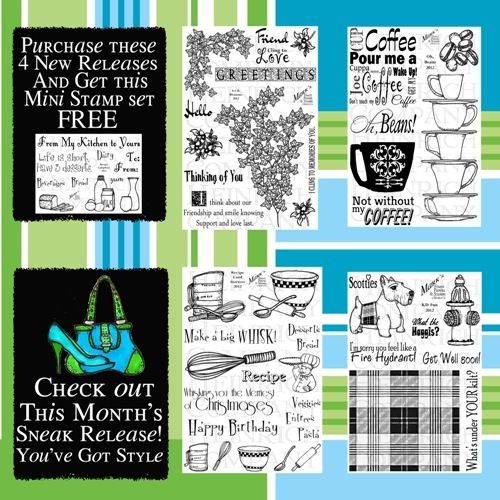 You have a chance to win one of the above stamp sets! Just comment on the following blogs (don't forget this one) each day for more chances to win! (You do NOT have to comment on all the blogs each day! The names are drawn randomly!) All four winners will be announced on December 22, 2012, on the Mark's Finest Papers blog. You can go back and comment if you missed a day. (HINT: The more you comment, the more chances you have to win; and comments on the MFP blog count twice!) The deadline for commenting is 11 PM EST on Friday December 21, 2012. WOW, can you believe it is December already? All of us here at Mark's Finest Papers, a Heinrich Co., want to wish all of you and your families a very Merry Christmas! 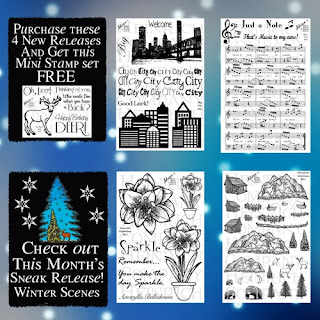 It is time for our December Blog hop, and we've got some great deals and stamp sets for you this month. In addition to great stamps and papers, did you know that Mark's Finest Papers also sells tools for your card-making adventure? One of them is the Scor-Pal. My projects this month all use the Scor-Pal and tutorials written for its use. I love doing fun fold projects! 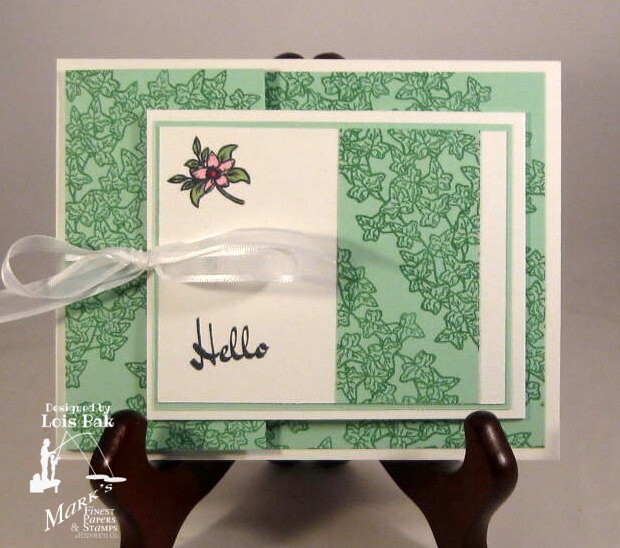 My first card using today's set, Ivy & Blossoms, is a variation on a criss-cross card, with two pockets instead of one. As you can see, there are two inserts in the card -- a larger one and a smaller one. Here are all the components of my card. You can see the top of the lighter green inside the card. There is a pocket behind that lighter green piece and a pocket in front of it. 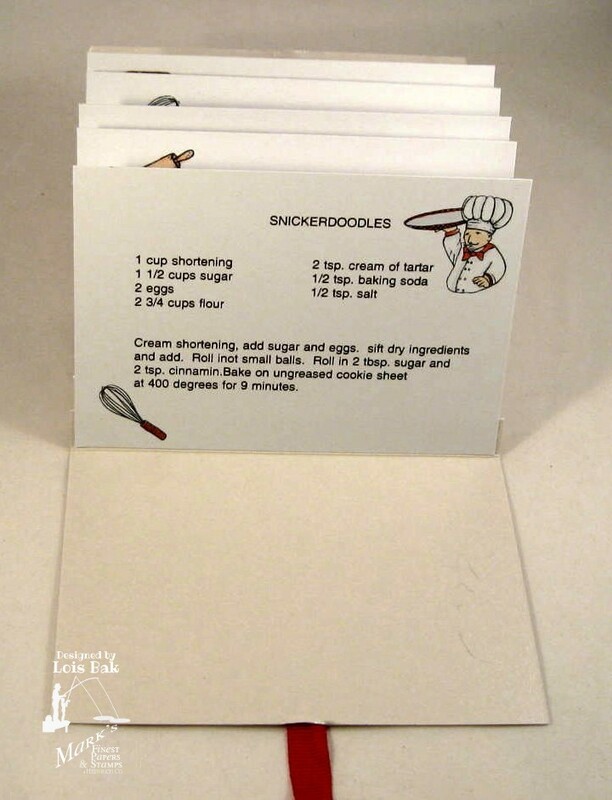 Here is the tutorial for this card. Scor-Pal calls it a Double Diagonal Pocket Card. 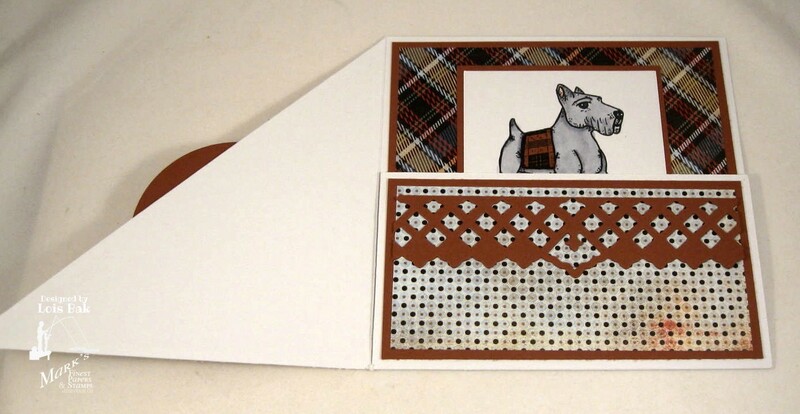 Scor-Pal calls the design for my second card Layered Folds. It is similar to, but not exactly the same as, a Joy Fold card, which I have made before. Here is the tutorial. 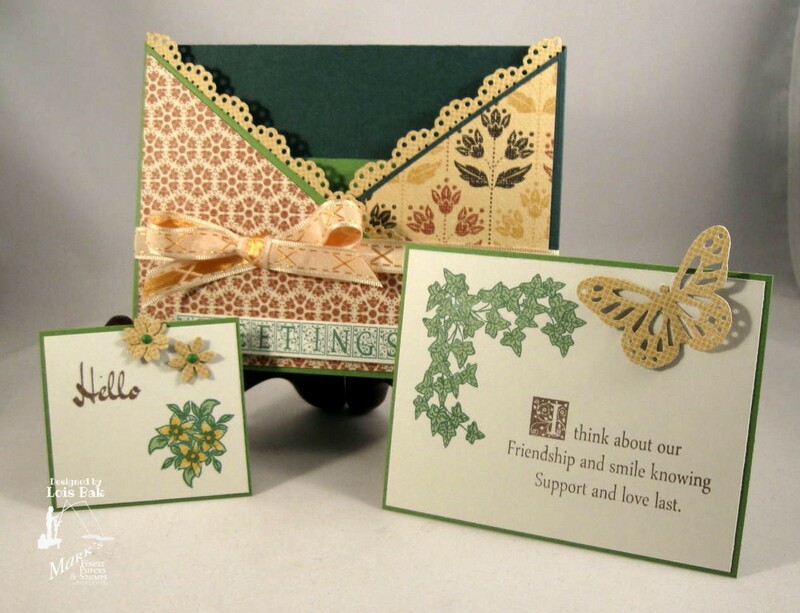 The directions call for designer paper, but I used the larger spray of ivy as a background to make my own designer paper for this card. 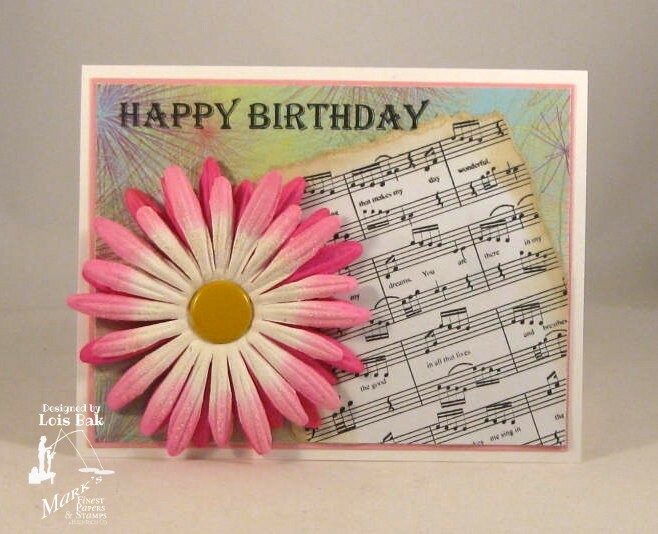 I stamped one flower on the front of the card and two flowers on the inside, as well as the smaller image of ivy. 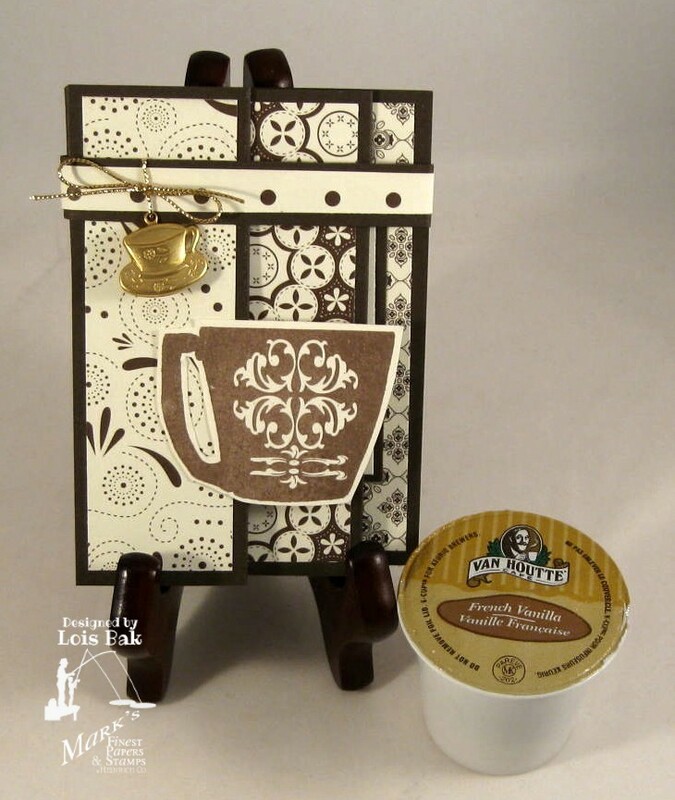 Be sure to check out the rest of the team members' blogs for their take on this really pretty set. Next on the list is Vicky Gould. Make sure you leave some love because the more you comment, the greater the chance you have to win a free stamp set. 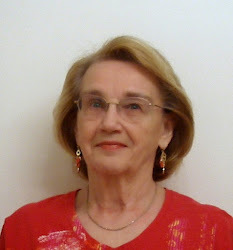 Kathy Bradley has a cute little tutorial on Speedy TV today. 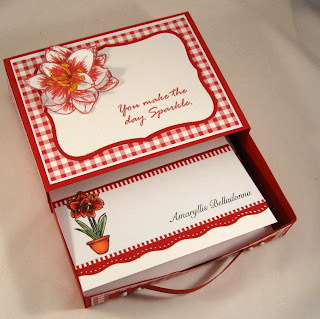 You could use it as an invitation to a party, or a place card AT your party -- or even as a birthday/special occasion card. I decided to use some suede paper and make a Santa hat for a Christmas party. Using Kathy's directions, I cut the hat itself from some fuzzy red suede paper and the brim from white. I punched out the pompom at the top with a 1 1/2 inch scallop circle punch. 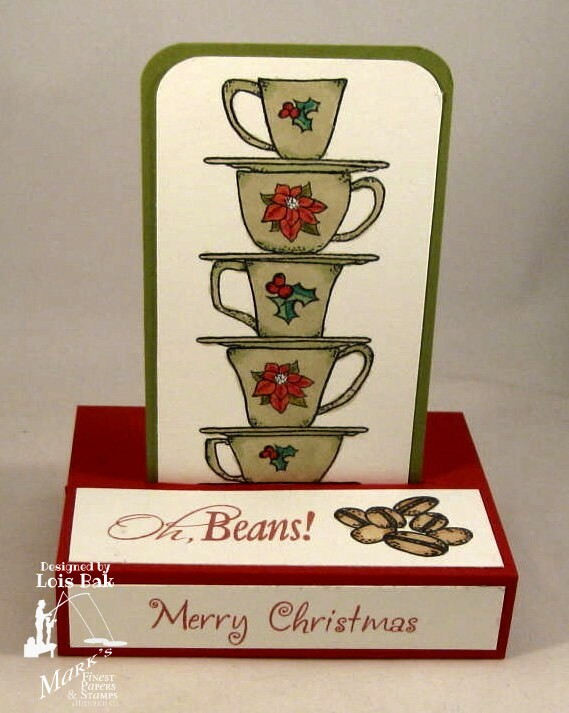 The sentiment is stamped with red StazOn ink, and the holly leaves/berries were stamped on cardstock, colored and cut out. I lined the inside with some festive Christmas DP from Cloud 9 Designs. 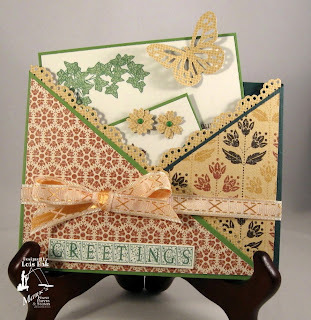 Be sure to check out Kathy's tutorial and the other cards made by the TTSTV design team over on Speedy TV. 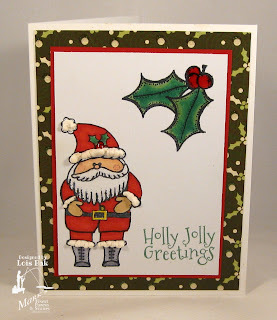 If you'd like to play along with the CCEE stampers, hop over to our blog and post your Santa card using Mr. Linky at the end of the post. We'll be back after the first of the year with another challenge. 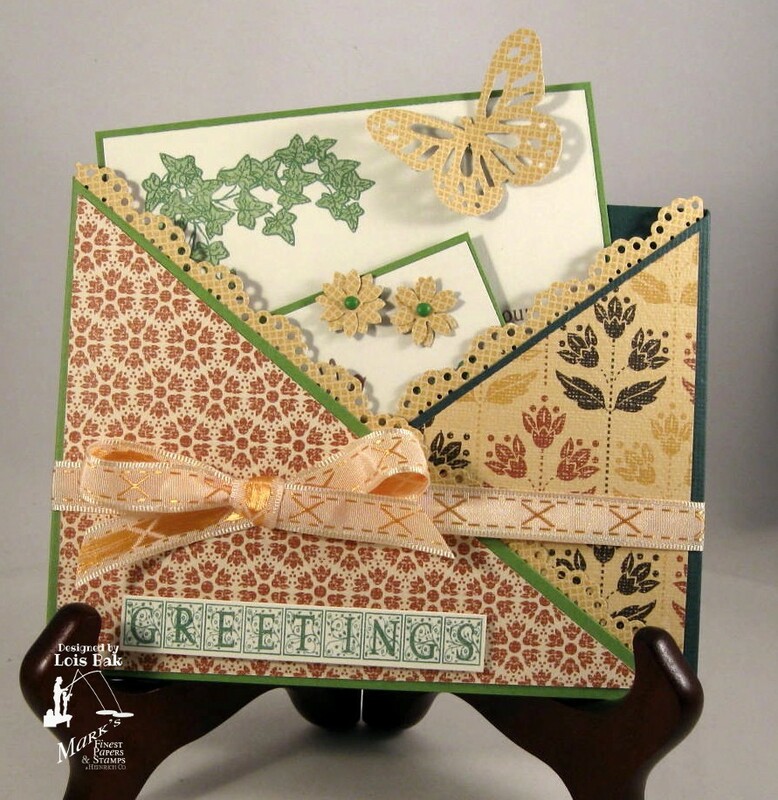 Cindy is the hostess for this week's CCEE Stampers challenge. She wanted us to use a favorite new die. I recently bought the Spellbinders 2012 Holiday Tree set, which includes a filigree tree and two ornaments. I'm using the two ornaments on my card. After cutting out the ornaments from white cardstock, I drew an outline of each ornament on a piece of gold cardstock and cut them out for a backing for each ornament. 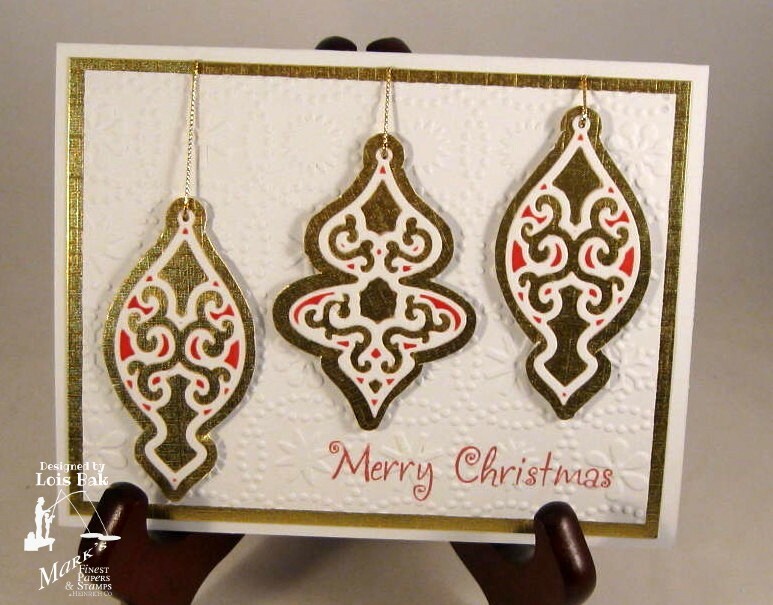 I stamped the sentiment on another piece of white cardstock and then embossed it with a snowflake embossing folder. 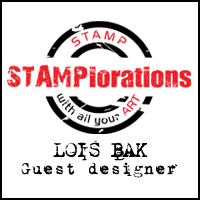 If you'd like to play along with the CCEE Stampers, we'd love to have you join us. 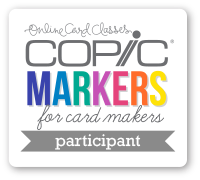 Just upload your card to the CCEE blog and link it with Mr. Linky at the bottom of the post. 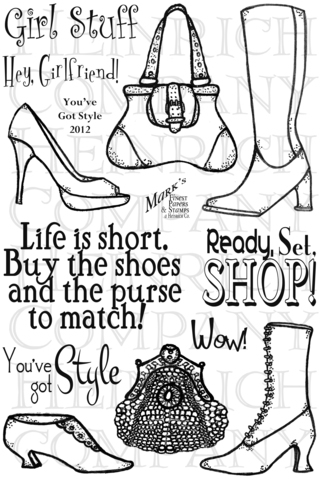 to win one of the above stamp sets! Just comment on the following blogs (don't forget this one) each day for more chances to win! (You do NOT have to comment on all the blogs each day. The names are drawn randomly!) 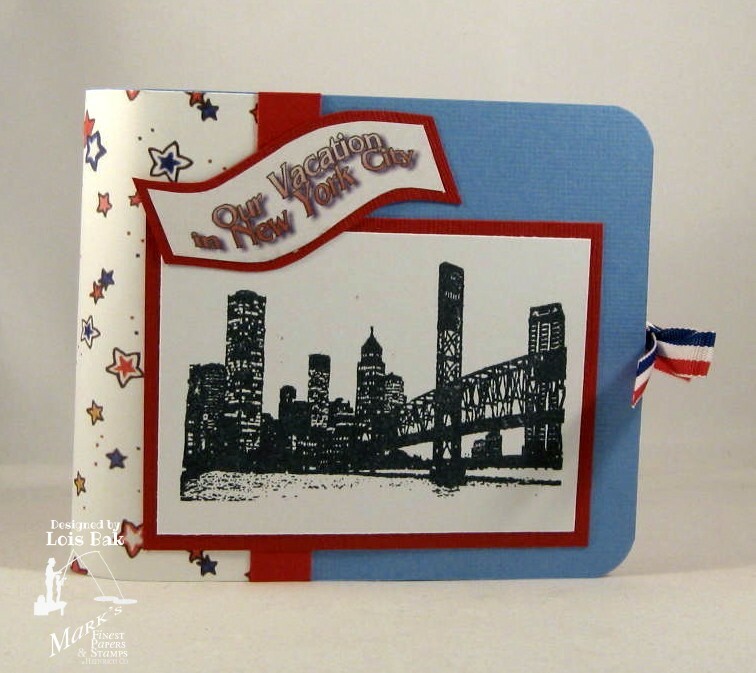 All four winners will be announced on December 1, 2012, on the Mark's Finest Papers blog. You can go back and comment if you missed a day. (HINT: The more you comment, the more chances you have to win; and comments on the MFP blog count twice!) The deadline for commenting is 11 PM EST on Friday November 30, 2012. 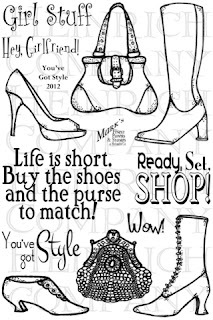 As you all know, November is the time to gear up for Christmas shopping. So many sales and crowds! Well, stick with us; we have some great deals for your Holiday Shopping needs. 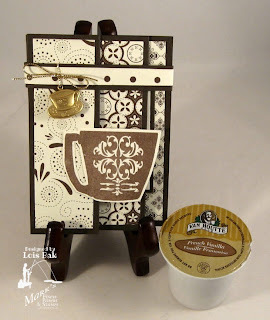 It's hard to believe that this is the last day of the blog hop. This week has flown by. I guess that's what happens as we count down to Christmas. My card for today is a birthday card, using the musical background and a couple of very large Prima flowers. 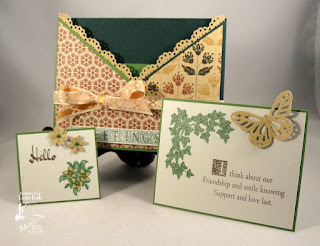 The sentiment is from the Celebrate mini set, which I received for participating in the September swap on Speedy TV. BTW, have you checked out the swaps over on Speedy TV? You only have to make four cards -- but you get three cards in return, as well as a free mini set. My second project is an altered junior legal pad. It was pretty simple to put together. I cut a white pocket portfolio folder in half, sliced one side of the pocket, folded it down just a little bit, and slid my junior legal pad over the pocket. After scoring down the center, I folded the other half over to make the cover and glued some designer paper on the front. I figured "just a note" was the perfect sentiment for my "notebook." I hope you have gotten some inspiration from the blog hop this week. All the designers worked hard to present interesting projects. Don't forget to comment on as many of the blogs that you can. The more you comment, the greater the chance you have to win a free stamp set. 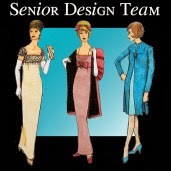 Patty P., Lois (that's me), Vicky, Jane C, Debbie, Pam, Pat G, Thrifty Stamper, MariLynn, Karen K, Bonnie, Kathy B, Angela B, Cathy C, Toni, Sue W, Kelli H, Janine B, Tammylee, Janis L, An'jenic, Kate Z, Mark's Finest Papers, a Heinrich Co.
to win one of the above stamp sets! Just comment on the following blogs (don't forget this one) each day for more chances to win! (You do NOT have to comment on all the blogs each day! The names are drawn randomly!) 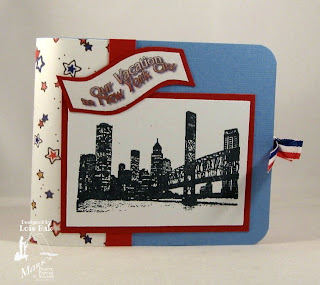 All four winners will be announced on December 1, 2012 on the Mark's Finest Papers blog. You can go back and comment if you missed a day. (HINT: The more you comment, the more chances you have to win; and comments on the MFP blog count twice!) The deadline for commenting is 11 PM EST on Friday November 30, 2012. My first project/card for today is serving two purposes. In addition to being the third card for the blog hop, it is also my card for the CCEE Stampers. This is the last week that Vicky Gould is the challenge hostess. Her challenge was to "lace your ribbon." 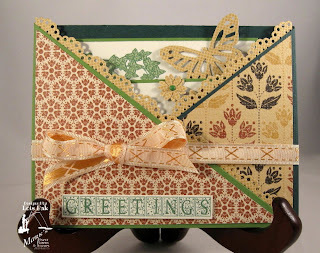 Using a Martha Stewart border punch, I punched the holes across the top and bottom of my embossed cardstock and then laced the grosgraine ribbon through the holes. 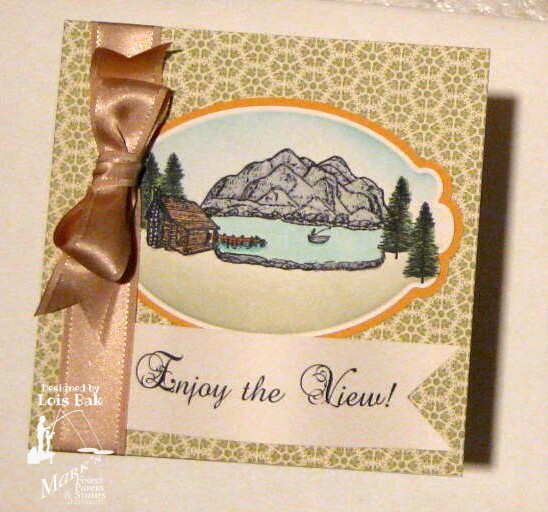 I used six different stamps from Mountain Selections to make my little mountain scene. The sentiment is from another MFP set called On the Fly (which was featured last month). 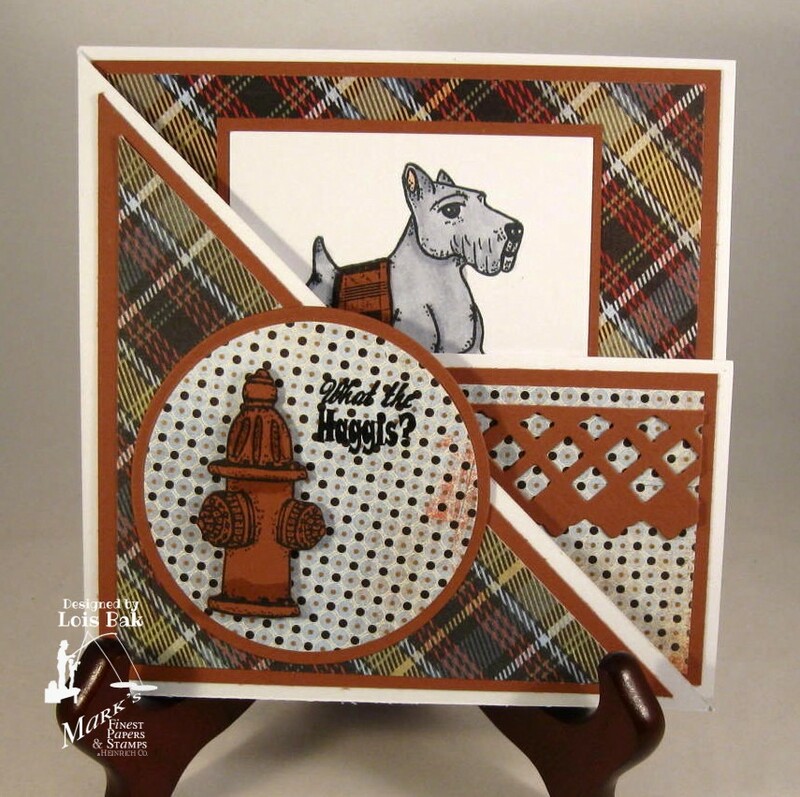 If you'd like to play along with the CCEE stampers, link your card up using Mr. Linky on the CCEE Stampers Blog. 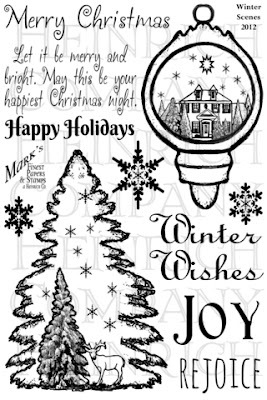 My second project is going to be a Christmas gift to my best friend and stamping buddy. 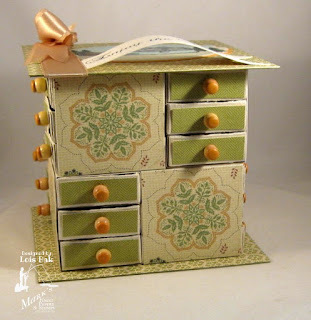 Using a tutorial I found on Splitcoaststampers and my Sizzix matchbox die, I created this little embellishment dresser. 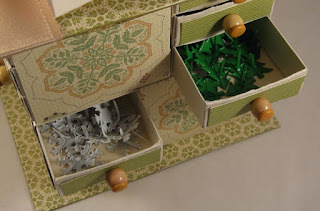 There are a total of 24 little matchboxes in this dresser. The knobs were made with wooden beads and brads. I put an assortment of embellishments in some of the drawers. Here is a close-up photo of the top of the dresser. As you can see, this is where I used the stamps from today's set. Again there are six separate stamps used on this image (the mountains, the rocks in front, the trees, the cabin, the pier, the boat/fisherman). The sentiment is from another one of last month's sets, Enjoy the View. 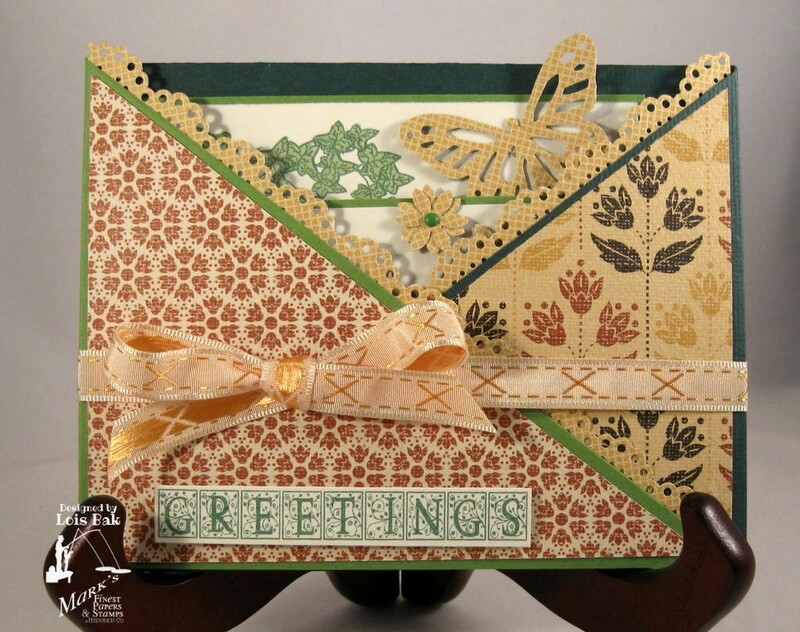 Be sure to check out the rest of the DT members' blogs for more creations using today's set. Every comment you make gives you another chance to win a free stamp set. 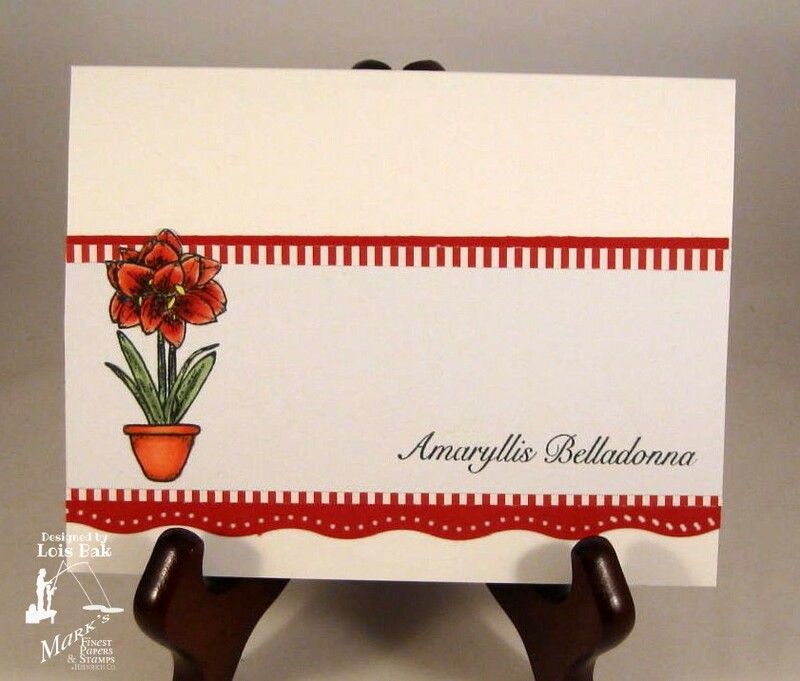 I have only one project that I made with today's set, Amaryllis Definition; however, it contains several elements. 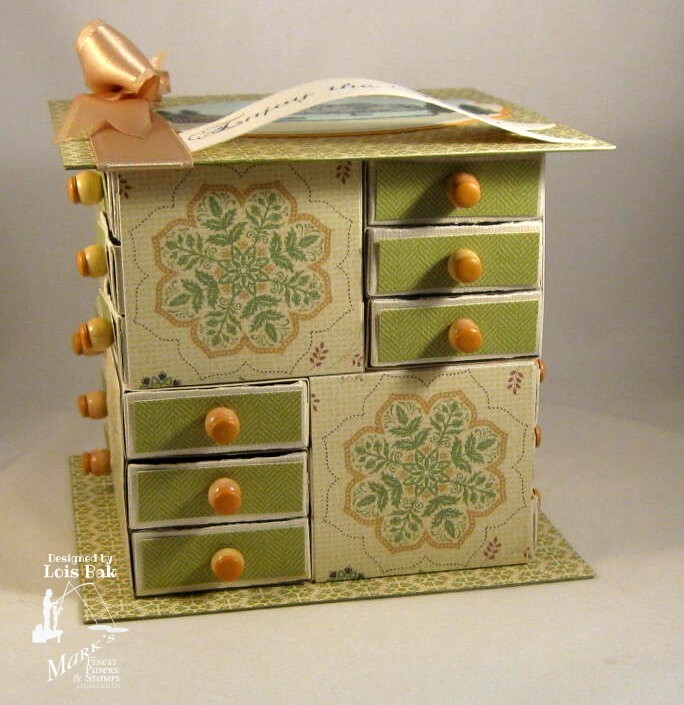 Using a tutorial from Splitcoaststampers, I made this Drawer Box. I googled "amaryllis" to get photos of several varieties, and I liked this one -- white w/red stripes. I stamped the large single flower three times -- cutting out the entire flower on one, the smaller center petals on the second, and just the stamens on the third. I then curled the petals using my bone folder and glued the two images together, attaching the cut-out stamens with a mini brad. You could probably use the drawer for a variety of things. I used it to hold some matching note cards. There are four sentiments included in this set. 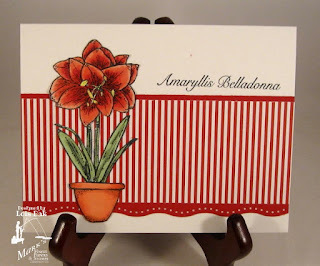 The one I used for the top of the box inspired me to use some Stickles on the stamens of my amaryllis. I just put the botanical name on the note cards. The box will probably hold six or eight cards. 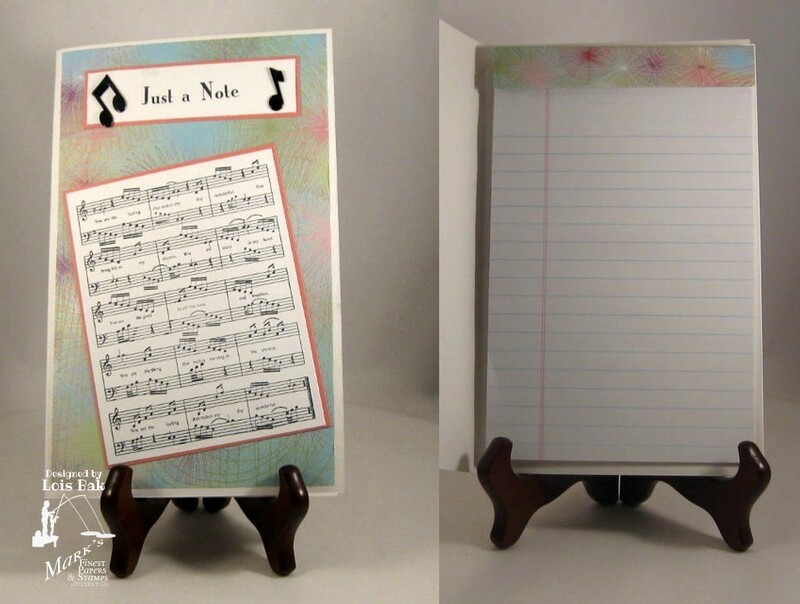 I made multiples of these two note cards. 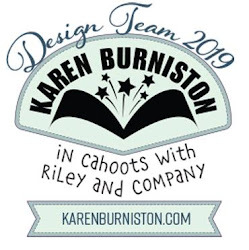 I hope you stop by the blogs of the rest of the DT members for more inspiration. 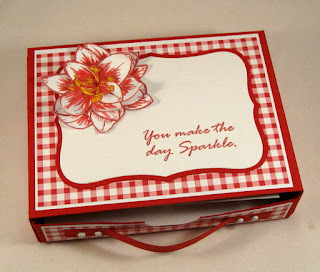 Remember, each time you comment on a blog, you have another chance to win some free stamps. Today's set is a little outside my comfort zone, but I dove right in. My card is a rather straight-forward CAS one. I stamped the images with Versafine Onyx Black on Snow Storm Smooth and added the pennant at the top. 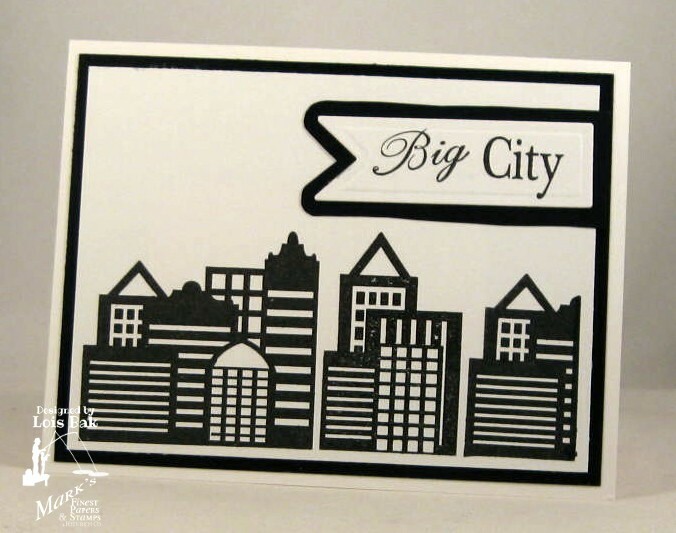 The word "City" is actually a very small part of the sentiment, as you can see if you look at the stamp set above. I masked off all but one "City" with post-it notes and inked it up. 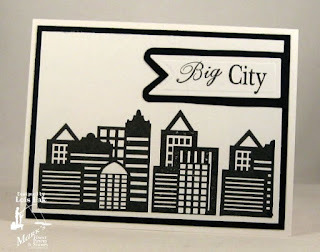 After removing the post-it notes, I stamped it on a scrap of white cardstock, lined up the word "Big" -- then cut it out with a pennant die. I've decided that I'm going to have a 3-D project each day this week. My project for today is a photo album. Even though the title of the album is "Our Vacation in New York City," this was a total virtual "trip." I've not been to New York City in over 40 years! All the photos are from the internet. The cover was made with some cardstock and two 4" x 4" coasters. 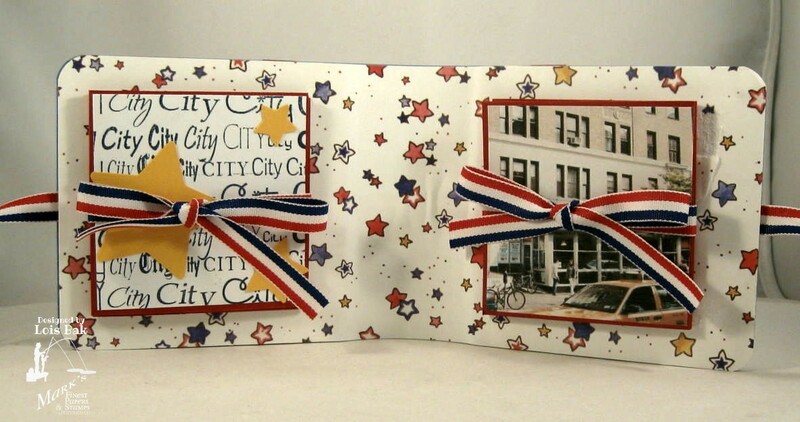 This is the album opened, showing two "stacks" of photos tied in ribbons. And this is the album with all the ribbons untied. 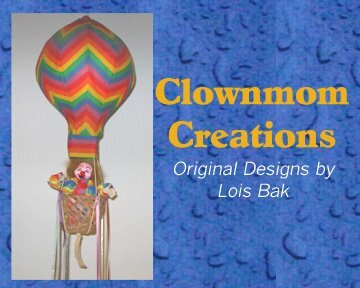 I found the tutorial for this little album on-line. Be sure to check out the rest of the team's creations. 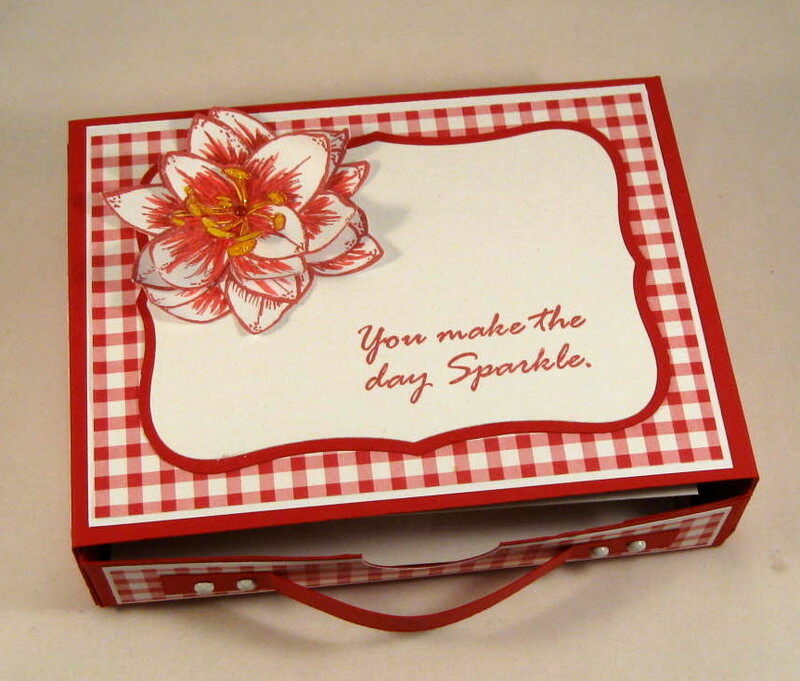 Each time you comment on a blog, you have another chance to win a free stamp set.